The dental team at St Clair Dental offer teeth whitening using Philips Zoom, widely known as one of the most effective systems available on the market today. 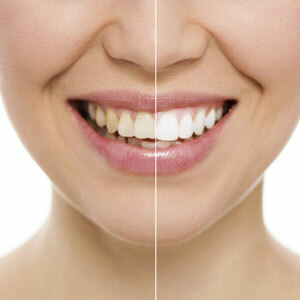 You can dramatically transform your teeth in a single visit or the comfort of your home. You’ll have brighter teeth for 18-24 months depending on your oral hygiene and lifestyle, such as the consumption of coffee and red wine. It can be touched up to keep your smile gleaming. For just $599, this one-time procedure can make your teeth eight shades whiter. First, a gel is applied to your gums to protect them. Then, the whitening accelerant is put on your teeth, using oxygen to penetrate the enamel that will cause whitening. You may have a temporary sensitivity to heat and cold or minor gum irritation. You can watch a television mounted in the ceiling, with your procedure time passing quickly. You’ll have an impression of your teeth taken to custom-create a mouth guard. You can then place the whitening gel on the tray and wear for an hour each night over the course of 1-2 weeks. The gel will penetrate deeply, and it offers reduced sensitivity. One of the primary advantages of the Zoom system is that any sensitivity is mild and temporary, lasting 1-3 days. We recommend that you use GC Tooth Mousse® cream applied to teeth a week before your procedure and for a week following completion, which will provide relief. Contact us today to book your whitening appointment! Convenient Saturday visits are available.